Supported by the Li Shu Fan Medical Foundation Professorship (to Leung WK). Conflict-of-interest statement: WKL has received honorarium for attending advisory board meetings of Boehringer Ingelheim and Takeda. Novel oral anticoagulants (NOACs), which include direct thrombin inhibitor (dabigatran) and direct factor Xa inhibitors (rivaroxaban, apixaban and edoxaban), are gaining popularity in the prevention of embolic stroke in non-valvular atrial fibrillation as well as in the prevention and treatment of venous thromboembolism. However, similar to traditional anticoagulants, NOACs have the side effects of bleeding, including gastrointestinal bleeding (GIB). Results from both randomized clinical trials and observations studies suggest that high-dose dabigatran (150 mg b.i.d), rivaroxaban and high-dose edoxaban (60 mg daily) are associated with a higher risk of GIB compared with warfarin. Other risk factors of NOAC-related GIB include concomitant use of ulcerogenic agents, older age, renal impairment, Helicobacter pylori infection and a past history of GIB. Prevention of NOAC-related GIB includes proper patient selection, using a lower dose of certain NOACs and in patients with renal impairment, correction of modifiable risk factors, and prescription of gastroprotective agents. Overt GIB can be managed by withholding NOACs followed by delayed endoscopic treatment. In severe bleeding, additional measures include administration of activated charcoal, use of specific reversal agents such as idarucizumab for dabigatran and andexanent alfa for factor Xa inhibitors, and urgent endoscopic management. Core tip: Although effective in the prevention and treatment of thromboembolism, novel oral anticoagulants (NOACs) are still associated with bleeding complications including gastrointestinal bleeding (GIB). Physicians should exercise caution in the prescription of these drugs with careful review of the indications and appropriate dosage, as well as balancing the risks and benefits. Nonetheless, patients perceived to have an increased risk of GIB should not be precluded from taking NOACs, if they are also at a high risk of stroke. Instead, physicians should recognize the risk factors associated with NOAC-related GIB in order to undertake preventive measures to reduce the risk of GIB. Novel oral anticoagulants (NOACs) include direct thrombin inhibitor (dabigatran) and direct factor Xa inhibitors (rivaroxaban, apixaban and edoxaban) are increasingly favored over conventional oral anticoagulants such as warfarin. NOACs are often used in the prevention of embolic stroke in non-valvular atrial fibrillation (AF) as well as in the prevention and treatment of venous thromboembolism (VTE). Compared with warfarin, NOACs have rapid onset and offset of action, predictable pharmacodynamics obviating regular therapeutic monitoring, and fewer food-drug or drug-drug interactions. Although NOACs have been shown to have a favorable safety profile from multiple meta-analyses and phase IV studies, the risk of bleeding, particularly gastrointestinal bleeding (GIB), is still a concern in high-risk patients. This review will discuss the risk of GIB related to commonly prescribed NOACs with special focus on the dosing of different indications and in patients with impaired renal function, differences in bleeding risk between randomized clinical trials (RCTs) and observational studies, risk factors for GIB, prevention and management strategies. Apart from “NOACs”, other terms that have been used to describe these new oral anticoagulants include direct oral anticoagulants (DOACs) and target-specific oral anticoagulants. There are also calls to restrict the term “NOACs” to “non-vitamin K oral anticoagulants” instead of “novel oral anticoagulants”, as this terminology is well established in the medical literature. Recently, it has also been advocated that term “DOACs” should be adopted as the name implies similar pharmacological actions of this class of oral anticoagulants that inhibit a single target. In this review, we use the term “NOACs” to refer to novel oral anticoagulants inclusive of dabigatran, rivaroxaban, apixaban and edoxaban. The characteristics and dosing of different NOACs are summarized in Tables 1 and 2. Dabigatran directly inhibits thrombin activity in a reversible manner. It is administered as a prodrug known as dabigatran etexilate and after absorption in the proximal small bowel, dabigatran etexilate is cleaved by serum and hepatic esterases to the active form. The bioavailability of dabigatran etexilate is 7% with the majority of non-absorbed drug being excreted in the stool. Absorbed drug is mainly excreted unchanged by the kidneys. The half-life of dabigatran ranges from 9 to 17 h, depending on individuals’ age and renal function. Dabigatran can be administered at a dose of 150 mg b.i.d or 110 mg b.i.d, and 75 mg b.i.d in the presence of renal insufficiency [creatinine clearance (CrCl) < 50 mL/min]. The drug is contraindicated in patients with severe renal impairment (CrCl < 30 mL/min) or advanced liver disease. Table 1 Characteristics of different novel oral anticoagulants. 1Idarucizumab is the only FDA-approved specific reversal agent currently. Tmax: Time to peak plasma level; T½: Half-life; GIB: Gastrointestinal bleeding. Table 2 Dosing of different novel oral anticoagulants according to indications and renal function. NOACs: Novel oral anticoagulants; AF: Atrial fibrillation; CrCl: Creatinine clearance; BW: Body weight; Cr: Creatinine; DVT: Deep vein thrombosis; PE: Pulmonary embolism; p-gp inhibitors: p-glycoprotein inhibitors. Rivaroxaban is a direct inhibitor of factor Xa, which reduces thrombin production. It has a bioavailability of 66%[7,8]. One-third of the absorbed drug is excreted by the kidney and two-thirds is metabolized by the liver into inactive forms. The half-life ranges from 6 to 13 h. Rivaroxaban is administered at a dose of 20 mg daily, and 15 mg daily if the CrCl is < 50 mL/min. The drug is also contraindicated in severe renal impairment (CrCl < 15 mL/min) or advanced liver disease. Similar to rivaroxaban, apixaban directly inhibits factor Xa. It has a bioavailability of 50%. Around 25% of the absorbed drug is excreted by the kidney with a half-life of around 12 h. Apixaban is administered at a dose of 5 mg b.i.d, and 2.5 mg b.i.d if patients has at least 2 of the following features: age 80 years or older, body weight 60 kg or less, or serum creatinine 1.5 mg/dL or more. Edoxaban is also a direct factor Xa inhbitior, with a bioavailability of 60% and a half-life of around 12 h. Renal clearance accounts for 50% of the total clearance. Edoxaban can be administered at a dose of 60 mg daily, and 30 mg daily if the CrCl is < 50 mL/min or body weight is less than 60 kg. The drug is contraindicated in severe renal impairment (CrCl < 15 mL/min) and advanced liver disease. Of note, serum levels of NOACs can be increased by potent inhibitors of p-glycoprotein and CYP3A4 (e.g., azole antifungal agents, protease inhibitors), while serum levels can be decreased by strong inducers of p-glycoprotein and CYP3A4 (e.g., rifampicin). There are several mechanisms by which NOAC causes GIB (Figure 1). 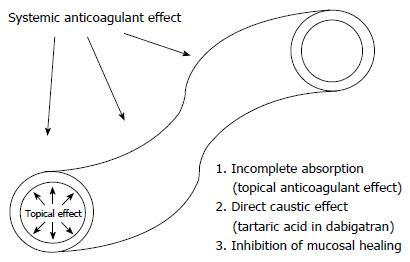 The anticoagulant effect can be local and/or systematic, and NOACs may inhibit GI mucosal healing. In addition, the tartaric acid in dabigatran etexilate is postulated to cause direct caustic injury. When compared with warfarin, dabigatran and rivaroxaban are associated with an increased risk of GIB only, but have not been demonstrated to increase bleeding in other organs including intracranial hemorrhage[1,10]. Of note, the sites of GIB differ for individual NOACs. In contrast to the usual pattern observed with warfarin, aspirin or non-steroidal anti-inflammatory drugs (NSAIDs) where upper GIB predominates, lower GIB accounted for 53% of major GIB seen in dabigatran users in the RE-LY trial. This has been hypothesized to be related to the incomplete absorption of the active NOACs in the upper GI tract with resulting increasing availability of dabigatran to the lower GI tract which exert topical effect on the mucosa leading to bleeding, especially in the presence of pre-existing lesions like angiodysplasias and erosions. On the other hand, the bioavailability of warfarin is more than 95%, and non-absorbed warfarin does not have any topical effect[1,10]. Notably, upper GIB appeared to be more common than lower GIB among rivaroxaban users (76 % vs 24%), while the risks of upper and lower GIB were comparable with high-dose edoxaban (60 mg daily)[6,14]. Figure 1 Pathogenesis of novel oral anticoagulant-related gastrointestinal bleeding. NOAC: Novel oral anticoagulant; GIB: Gastrointestinal bleeding. The dosing of NOACs may also affect the risk of GIB[1,10]. Both rivaroxaban and apixaban are factor Xa inhibitors, administered in active form, and have similar bioavailability. However, these two agents differ in the risk of GIB, which may be related to the higher peak level of once-daily dosing of rivaroxaban than the twice-daily dosing of apixaban. Similarly, the once-daily dosing of rivaroxaban may also account for the higher GIB risk observed in the head-to-head study of rivaroxaban and dabigatran. Holster et al summarized the risk of GIB associated with NOACs in a recent meta-analysis, which included 17 RCTs with a total of 75081 patients who received either NOACs or standard care (defined as either low-molecular-weight heparin, vitamin K antagonist, antiplatelet therapy or placebo). During a follow-up period ranging from 3 wk to 31 mo, there was a 1.5% GIB event, with 89% being major GIB (defined as GIB leading to a decrease in hemoglobin ≥ 2 g/dL within 24 h, a transfusion of ≥ 2 units of packed red cells, necessitating intervention including surgery, or fatal bleeding). The number needed to harm was 500. Overall, there was an increased risk of GIB among NOAC users, compared with standard care [pooled odds ratio (OR) 1.45], though significant heterogeneity existed regarding drug choices and the indications of anticoagulation. Among different NOACs, both dabigatran and rivaroxaban were associated with a higher risk of GIB (OR 1.58 and 1.48, respectively), but not apixaban and edoxaban. However, since there are still no direct head-to-head comparisons of GIB risks among various NOACs in RCTs, it is difficult to conclude which drug has the lowest GIB risk. As patient characteristics differed across studies, indirect comparisons can be misleading. For various indications of NOACs, the highest risk of GIB was seen in patients with acute coronary syndrome (OR 5.21), in whom NOACs were co-prescribed with antiplatelet agents. Patients prescribed NOACs for deep vein thrombosis and pulmonary embolism also had an increased risk of bleeding (OR 1.59). However, the GIB risk was not significantly increased in patients receiving NOACs for prevention of VTE after orthopedic surgery and in medically ill patients. Although there was no significant increase in the overall risk of GIB among all patients receiving NOACs for AF, subgroup analysis showed an increase in risk among dabigatran and rivaroxaban users. The increased GIB risk in AF (but not with thromboprophylaxis after orthopedic surgery) among dabigatran and rivaroxaban users is likely explained by the duration effect, as orthopedic patients usually receive NOACs for a short, finite period (few weeks only). It has also been shown that among patients receiving dabigatran, only the higher dose (150 mg b.i.d) was associated with a higher GIB risk when compared with warfarin, indicating a dose-related effect[12,19-22]. The risk of GIB was also increased with high-dose edoxaban of 60 mg daily (HR 1.23), but was reduced with low-dose edoxaban of 30 mg daily (HR 0.89). However, subsequent systematic reviews and meta-analyses which included more trials with different inclusion and exclusion criteria yielded conflicting results, showing either no or only a marginal increase in the risk of GIB[23-29]. As most RCTs adopted stringent inclusion and exclusion criteria to enroll patients with relatively low risk of GIB, the results may not be generalizable to the general population. It was initially estimated that when NOACs were marketed, the risk of bleeding could be increased up to 15-fold as a result of prescription of these drugs to patients with higher risk of GIB. In addition, RCTs that separately reported on GIB were usually limited to major GIB only, leading to an underestimation of the risk of all GIB. To determine the association between NOACs and GIB in real-life settings, a recent meta-analysis included 8 cohort studies with a total of 117339 NOAC users of either dabigatran or rivaroxaban. The pooled incidence rates of GIB were 4.5 per 100 patient-years and 7.18 per 100 patient-years for patients receiving dabigatran and rivaroxaban, respectively. Compared with warfarin, dabigatran was associated with an increased risk of GIB [relative risk (RR) 1.21], but rivaroxaban did not confer a significant increase in risk. However, one could not conclude that rivaroxaban had a lower GIB risk compared with dabigatran, as the non-significant association with GIB risk for rivaroxaban may be related to fewer observational studies, a shorter follow-up duration and an overall younger age of rivaroxaban users. In fact, in a recent head-to-head comparative observational study that recruited 118891 patients with non-valvular AF who were aged 65 years or older, rivaroxaban was found to be associated with a higher risk of major GIB compared with dabigatran (150 mg b.i.d) [hazard ratio (HR) 1.40]. Although the differences in baseline characteristics were adjusted by propensity scores in this study, the result should still be interpreted with caution due to the possibility of residual confounding by unmeasured factors. Contrary to previous postulation, the risk of GIB was slightly lower in observational studies when compared with that reported in RCTs. Several factors may account for this finding. Firstly, RCTs recruited older patients who had higher risk of stroke. In the four landmark phase III RCTs (RE-LY, ROCKET-AF, AIRSOTLE, ENGAGE AF-TIMI 48 trials)[14,20,31,32], the mean or median age of NOAC users was 70 years or above, while subjects from 5 studies included in the meta-analysis of cohort studies had a mean age below 70 years[33-37]. Secondly, patients from observational studies had fewer comorbidities, as reflected by a lower CHADS2 (congestive heart failure, hypertension, age of 75 years or above, diabetes mellitus, history of stroke, transient ischemic attack or thromboembolism) score. Thirdly, physicians may avoid prescribing NOACs to high-risk patients in real-life practice. One major concern about the meta-analysis of observational studies is that the results may be biased due to confounding factors. Nonetheless, major confounding factors including age, use of gastroprotective agents and ulcerogenic agents (including antiplatelet agents, NSAIDs, steroid and selective serotonin reuptake inhibitors), as well as indications of anticoagulation were evaluated by subgroup and sensitivity analysis. As for apixaban and edoxaban, observational studies comparing their risk of GIB with that of warfarin are currently lacking. Factors associated with the NOAC-related GIB are summarized in Table 3. Older age (≥ 75 years) was associated with an increased risk of NOAC-related GIB. Among patients receiving dabigatran, there is a 2.5-fold increase in risk of GIB[12,34,36,38]. A greater risk of major GIB was also observed in older patients receiving rivaroxaban[34,39]. As elimination of NOACs depends on renal excretion, patients with impaired renal function are more likely to have drug accumulation and hence higher bleeding risk. A prior history of peptic ulcer disease or GIB was associated with a 2.3-fold increased risk of GIB. Concomitant antiplatelet therapy is also a well-recognized risk factor[12,16,38,40]. For example, among dabigatran users, concomitant antiplatelet use was associated with a 30% to 50% higher risk of GIB[12,38]. Table 3 Risk factors for novel oral anticoagulant-related gastrointestinal bleeding. NOAC: Novel oral anticoagulant; GIB: Gastrointestinal bleeding; NSAIDs: Non-steroidal anti-inflammatory drugs. Ethnicity was another risk factor. Chinese patients receiving dabigatran were observed to have a higher incidence rate of GIB (4.2 per 100 person-years), compared with the western population (1.2 to 1.5 per 100 person-years in Denmark and 0.6 to 3.4 per 100 person-years in the United States)[22,41]. Genetic factors, particularly factor V-Leiden mutation which is exceedingly rare in the Asians, may account for this difference[42-44]. The HAS-BLED score (hypertension, abnormal liver/renal function, history of stroke, bleeding tendency, labile INRs, elderly aged ≥ 65 years, drug/alcohol use) was initially derived to predict bleeding risk of warfarin in patients with AF (Table 4). A score of ≥ 3 is considered high-risk, with a score of 3 conferring a risk of 3.74 bleeding events per 100 patient-years[45,46]. However, it should be acknowledged that patients with an increased risk of thromboembolism usually have one or more of the comorbidities included in the HAS-BLED score, which predispose them to bleeding. Other risk factors for GIB [e.g., Helicobacter pylori (HP) infection, colonic diverticulosis, or presence of angiodysplasias] should also be considered in the decision making when prescribing NOACs. Concurrent use of antiplatelet agents and NSAIDs also increases the bleeding risk and should factor into the decision making. Table 4 Components of HAS-BLED bleeding risk score. Maximum score is 9. ULN: Upper limit of normal; INR: International normalized ratio; NSAIDs: Non-steroidal anti-inflammatory drugs. Co-administration of gastroprotective agents [either proton pump inhibitors (PPIs) or histamine H2-receptor antagonists (H2RAs)] was found to be associated with a 50% reduction in the risk of GIB. This protective effect seems to be confined to the upper GI tract among those who had history of peptic ulcer disease or GIB. PPIs offered a slightly better protective effect than H2RAs, with the largest effect seen in patients using both PPIs and H2RAs (85% reduction in the risk of GIB). The protective effect may be mediated by the reduction of bleeding from pre-existing peptic ulcers. In addition, acid suppression may reduce the absorption of dabigatran[20,48]. While the impact of gastroprotective agents is strong for dabigatran-related GIB, the effect appears to be modest for rivaroxaban. Prevention of GIB relies on first reviewing the indications of NOACs and avoiding NOACs in patients with contraindications, including renal impairment (CrCl less than 30 mL/min for dabigatran and CrCl less than 15 mL/min for other NOACs), and advanced liver disease with coagulopathy. Other preventive measures include the use of appropriate dosage with reference to the CrCl, institution of renal protective measures (e.g., avoiding NSAIDs and herbs), correction of modifiable risk factors (e.g., HP eradication, alcohol abstinence, avoidance of co-administration of antiplatelet agents or NSAIDs). For patients identified to be at high risk for GIB (e.g., HAS-BLED score ≥ 3, history of previous GIB), prescription of gastroprotective agents[1,10,47] and use of apixaban or low-dose dabigatran (110 mg b.i.d) are recommended[6,50]. However, it is also important to note that lower dose of NOACs is less efficacious in stroke prevention. For the same reason, the use of HAS-BLED score is meant to “flag up” patients at high risk for GIB rather than to withold anticoagulation. For those who have experienced GIB while on warfarin, dabigatran (150 mg b.i.d) or rivaoxaban, reducing the dose of dabigatran to 110 mg b.i.d or switching to apixaban may be considered[1,50]. Screening and surveillance colonoscopy has been advocated to detect occult tumors before initiation of NOACs, hence reducing the incidence of tumor-associated GIB[6,52]. This practice, however, is not the standard of care recommended by the American Heart Association and American Stroke Association (AHA/ASA) or the CHEST guidelines. Interestingly, NOACs may lead to an earlier diagnosis of GI tract malignancies as they may provoke bleeding of these lesions. Specific management of patients taking NOACs who present with overt, non-major GIB involves cessation of the drug and endoscopic management[1,10,49]. Owing to the short half-life, cessation of drug will lead to a rapid return of the coagulant function within 12-24 h and near complete recovery after five half-lives in patients with normal renal function[5,10]. In the case of severe bleeding and/or hemodynamic instability, activated charcoal, hemodialysis/hemoperfusion and reversing anticoagulation can be considered. Activated charcoal can be given to reduce intestinal absorption of residual drug if the last dose of the NOAC is taken within 2 h. This potential benefit needs to be weighed against subsequent impairment of endoscopic visualization. Hemodialysis or hemoperfusion may also be considered for dabigatran in the case of life-threatening GIB or renal failure, but not for direct factor Xa inhibitors as they are highly protein-bound. Non-specific reversal agents include prothrombin complex concentrates (PCCs) (either weight-based 3-factor or 4-factor PCCs), activated PCCs and recombinant factor VIIa (rFVIIa). However, well-designed clinical trials are not available to prove their efficacy, and their use was also infrequent in the phase III trials and observational studies[5,49]. Moreover, their use has been associated with a risk of thromboembolism[55-57], although it has been shown in a recent study that 4-factor PCCs actually had a similar safety profile compared with fresh frozen plasma in terms of thromboembolic events (around 7%) and deaths. Given the uncertain efficacy and the potential risk of thromboembolism, these agents should only be considered in the following situations: life-threatening GIB, ongoing bleeding despite standard measures, or delayed clearance of NOACs in patients with renal failure. Anti-fibrinolytic agents (tranexamic acid) have been used in the management of NOAC-related GIB, but the experience is still limited[49,59]. FFP and cryoprecipitate are not effective in reversing the anticoagulant effect. Specific reversal agents have also been developed recently. Idarucizumab, a humanized monoclonal antibody fragment (Fab) against dabigatran, is shown to be able to completely reverse anticoagulation in around 90% of patients, and has been approved in the United Sates. Andexanet alfa is a recombinant modified human factor Xa decoy protein which binds to the factor Xa inhibitors, and therefore is a universal factor Xa reversal agent. It has been shown to substantially reverse anti-factor Xa activity, with hemostasis achieved in around 80% of patients presenting with acute major bleeding. Aripazine is a cationic small molecule that can prevent NOACs (including dabigatran and factor Xa inhibitors) from binding with their targets through non-covalent binding and charge-charge interaction. It is still in the developmental phase, but has shown promising results. However, these agents are also associated with thromboembolic risks. For instance, around 5% and 18% developed thromboembolism after receiving idarucizumab and andexanet alfa, respectively[60,61]. The timing of endoscopy depends on the severity of GIB and hemodynamic status of the patients. In patients with mild GIB, endoscopic evaluation can be deferred for 12-24 h[10,63]. Advantages of this delayed approach are increased effectiveness of endoscopic intervention as the drug effects have worn off, increased safety in a non-emergency setting, and improved endoscopic visualization due to attenuation/cessation of bleeding and better colonic cleansing. On the other hand, if patients present with severe GIB or are hemodynamically unstable, emergency endoscopy should be performed promptly after resuscitation. Radiological and/or surgical interventions will be the last resort if repeated endoscopic management fails. Compared with warfarin, there is a higher risk of GIB for high-dose dabigatran (150 mg b.i.d), rivaroxaban and high-dose edoxaban (60 mg daily). Reviewing the indications of NOACs and prescribing a particular NOAC on an individual basis are therefore of utmost importance. In addition, physicians should be aware of the risk factors for NOAC-related GIB and adopt preventive measures accordingly. In the majority of cases, overt GIB can be handled by withholding NOACs combined with delayed endoscopic treatment.